Despite the appearance, Microsoft does not play in the Information Technology industry. It is just an illusion. 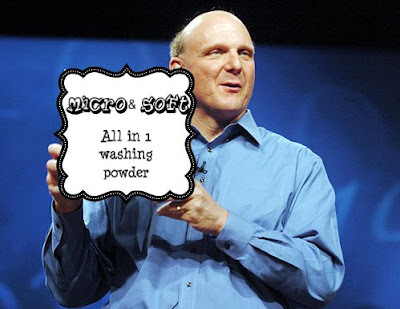 No, in reality, Microsoft is in the business of washing powders... and it always has been in its core marketing values. True, look at this video of Ballmer selling windows 1.0; that makes me think of a P&G salesman trying to convince us to buy "Tide". When you are a true technologist, it is not about trying "to do better than others in mobile and search" or "taking market shares" from Google, in the first place. He is already late by saying that and reveals he uses old-fashioned marketing methods that worked only in the ancient TV-complex industry. As a result, Micro&Soft is becoming obsolete even in its original mission: "to put a computer in every desk in every home running Windows": As Steve Jobs said, we are at least in a post-pc era, where computing devices of the size of a pocket are prominent; talking about PC is not relevant any more, big man. No, the business of a true Information Technology company is to enhance the informational richness of our every-day life by delivering as much as possible relevant & real-time knowledge on the status of our reality; The mission of Google of allowing every people to access to all the information of the world, is one instance. that high IQ big man should go to the hedge fund industry.